On the 27th September my father, Michael Atherton Hampson, was shot and killed on our farm here in South Africa. His final actions were to distract the perpetrators from killing my brother. They had assaulted my brother and tried to stab him multiple times, and then shoot him from point blank range. Fortunately at that moment the firearms safety was on, which saved his life. What makes me so proud is that both my brother and my father each fought for the safety of the other. During the assault my brother had shouted for my dad to drive away to safety and when he felt that dad was safely away, had fled himself into the nearest sugarcane field. My father had then clearly decided he could not leave his son to die and had stopped or slowed his vehicle enough to bring the two killer's attention to him, who then ran to the vehicle and shot him. The response from our community on the day and in these few weeks since have been absolutely incredible, and often I find myself in tears not only from the loss that we feel, but from the incredible love and support that we have been given by so many people. It has also been an incredible eye opener to see just how many lives my father touched during his 69 years. The stories of his incredible spirit that have been flooding in since his death have been absolutely amazing. I'd like to thank everyone who has given us support, love and prayers, who has visited, phoned and messaged. I cannot tell how much we appreciate it all. 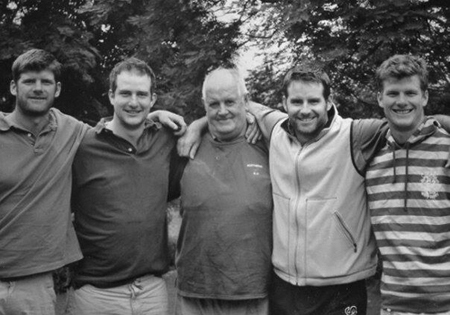 My father now lives on through the legacy that he created through his four sons and their children. I hope and pray that I can live up to that legacy - the legacy of family, respect, honor, integrity, honesty, fair play, and the service to others, all those things that he so strongly believed in. I am proud to say that my Father is my Hero! And once again I have been reminded, as I was in 2010 when my best friend, Calvin Krause, was taken from this earth, that life is short - appreciate it and live it fully. Hopefully I will be able to return to writing a regular Fundraiser Buzz eZine as of next week, but there is so much still to be done that I cannot guarantee that. But if it is not next week, it will be soon enough. Thank you for staying subscribed. All the best with your fundraising!